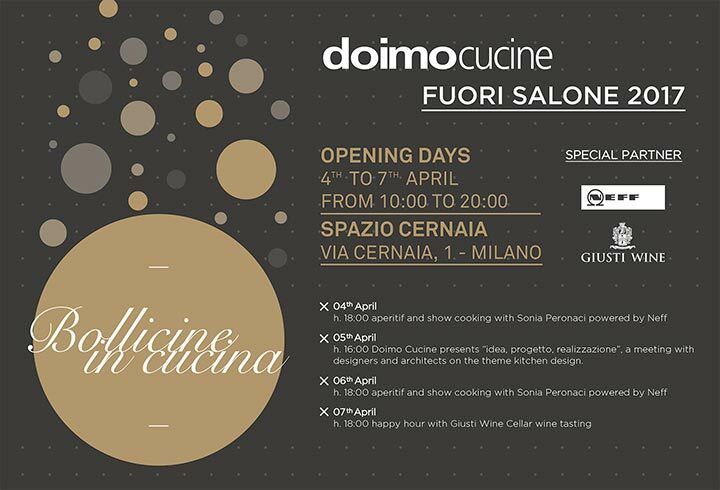 For the Salone del Mobile.Milano 2017 Doimo Cucine opens the doors of Spazio Cernaia, via Cernaia 1, in the Brera Design District. Four days of meetings, from 4th to 7th April, in which we will test our kitchens, equipped with built-in appliances Neff, with the dynamic Sonia Peronaci, the founder of Giallo Zafferano and now involved in other projects. On Tuesday and Thursday she will be the star of our happy hours with her show cooking. And then, of course, a lot of sparkling Prosecco that we bring with us from our region. We will be well-supplied with the Giusti Wine cellar and its tasting proposal.